Daniel Sturridge marked his return to Liverpool's starting line-up by scoring twice and Divock Origi netted a hat-trick as Jurgen Klopp's side thrashed Southampton to set up a League Cup semi-final tie against Stoke. Sadio Mane gave Southampton the lead inside the first minute but Sturridge struck twice in four minutes midway through the first half to put Liverpool in command. Origi deflected in Alberto Moreno's shot right on the interval - his first goal for Liverpool - and there was no way back for Southampton as they ended up well beaten and outclassed. The young Belgian hammered home a spectacular fourth before substitute Jordon Ibe, on for Sturridge just before the hour, drove home a fine finish and Origi glanced home a header for his third and Liverpool's sixth to complete the rout. The manner in which Sturridge turned this tie on its head in the 24th minute was the perfect example of what he gives to Liverpool - when he is available. The Reds had spent the early stages on the retreat and were trailing to Mane's first-minute goal when a display of Sturridge's natural finishing shifted the emphasis of the game decisively. He initially looked to have lost control but took advantage of Steven Caulker standing off to show fast feet and send a superb finish flying across Saints keeper Maarten Stekelenburg. The striker was at it again two minutes later, showing natural movement and an instinctive finish from Emre Can's perfectly weighted pass. Sturridge's repeated injury absences with a variety of ailments have been a constant narrative of his Liverpool story and did much damage to Brendan Rodgers' attempt to revive the side following the title near miss and departure of Luis Suarez in summer 2014. His two goals here on his fifth appearance of the season left the 26-year-old with hugely impressive goalscoring statistics given his limited appearances in recent times. Sturridge has scored 44 times in 73 appearances for Liverpool, 39 of them from 59 starts, and has six in his last five League Cup games. The figures build a monument to his importance. The biggest question of all is whether the England striker will ever be fit enough for long enough to deliver fully on his rich talent. Sturridge's successful return may just have been helped by a masterstroke of man-management from Klopp - who delivered a less-than-gentle jolt in the striker's direction. When Sturridge pulled out of last week's Europa League tie against Bordeaux at the last minute with a foot injury, Klopp was inevitably quizzed about his absence. He said: "Your body has to learn to adapt to new intensities of training and in this time you have to learn what is serious pain and what is only pain." It was a statement of what Klopp will be demanding. If you are not prepared to play through pain, you are no use to a coach whose trademark is the intensity and fitness of his teams. It may be just what Sturridge needs - and if the Klopp approach works both Liverpool and England will be the beneficiaries. He has worked on other players too, encouraging Adam Lallana to believe he can recreate the form he showed under Mauricio Pochettino at Southampton, with the styles demanded by both managers similar. And what about Origi? The 20-year-old looked a lost soul in his early performances under Rodgers but Klopp immediately worked on the striker's confidence, revealing how he wanted him to sign for Borussia Dortmund and after his first game in charge saying: "We will have a lot of fun with this player." Fun it was on Wednesday as he turned in Moreno's shot for Liverpool's third, struck a savage rising shot for the fourth and glanced home a late header to complete his hat-trick. Under Rodgers, the powerful youngster appeared to have no focus, wandering anywhere but into positions where he could do serious damage - not a bit of it here. Klopp has shown his faith in Origi and was royally rewarded with a display of raw power and fine finishing. After Sturridge's opening two goals the question was could Klopp devise a formula where he could fit in alongside £32m Christian Benteke. As the game wore on and Origi grew in influence, the debate switched to how Klopp might utilise all three in the weeks ahead - a triumvirate of power, pace and goalscoring talent. "Are Liverpool contenders for the title? You can only go on what we saw tonight and things can change quickly. This was mesmerising. 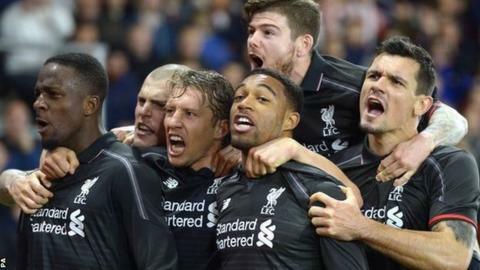 "It was a complete performance and a big warning to the rest of the league. The challenge for Jurgen Klopp and Liverpool now is to find a way to break down teams who will go to Anfield, sit deep and not allow Liverpool to play through them, but there is something very good happening. "People talk about a 'new-manager bounce', but this is a complete change of direction. Everyone looks happy and everyone knows his job. You would not play that way if you did not believe in what you were doing. "If you forget the first 10 minutes, it was almost the perfect performance from Liverpool. Daniel Sturridge's two goals were just a little taster. There is more to come from him. It was wonderful." Southampton host bottom side Aston Villa in the Premier League on Saturday (15:00 GMT), while Liverpool travel to second-bottom Newcastle on Sunday (16:00 GMT). Match ends, Southampton 1, Liverpool 6. Second Half ends, Southampton 1, Liverpool 6. Attempt saved. Emre Can (Liverpool) right footed shot from the right side of the box is saved in the bottom left corner. Foul by Lucas Leiva (Liverpool). Foul by Connor Randall (Liverpool). Virgil van Dijk (Southampton) wins a free kick on the left wing. Goal! Southampton 1, Liverpool 6. Divock Origi (Liverpool) header from the centre of the box to the bottom right corner. Assisted by Brad Smith with a cross. Attempt blocked. Divock Origi (Liverpool) right footed shot from outside the box is blocked. Assisted by Lucas Leiva. Attempt missed. Shane Long (Southampton) right footed shot from the centre of the box misses to the left. Attempt blocked. Shane Long (Southampton) left footed shot from the right side of the box is blocked. Assisted by James Ward-Prowse with a headed pass. Delay in match Jordon Ibe (Liverpool) because of an injury. Jordon Ibe (Liverpool) wins a free kick in the defensive half. Foul by Virgil van Dijk (Southampton). Lucas Leiva (Liverpool) wins a free kick in the defensive half. Substitution, Southampton. Oriol Romeu replaces Steven Davis. Substitution, Liverpool. Brad Smith replaces Alberto Moreno. Substitution, Liverpool. Jordan Henderson replaces Joe Allen. Goal! Southampton 1, Liverpool 5. Jordon Ibe (Liverpool) right footed shot from the centre of the box to the bottom right corner. Assisted by Alberto Moreno. Goal! Southampton 1, Liverpool 4. Divock Origi (Liverpool) right footed shot from the right side of the box to the top right corner. Assisted by Jordon Ibe with a through ball. Attempt blocked. Virgil van Dijk (Southampton) right footed shot from outside the box is blocked. Emre Can (Liverpool) is shown the yellow card. Attempt missed. Shane Long (Southampton) header from the centre of the box is close, but misses to the right. Assisted by Dusan Tadic with a cross. Substitution, Southampton. James Ward-Prowse replaces Cédric Soares. Substitution, Southampton. Shane Long replaces Jordy Clasie. Joe Allen (Liverpool) wins a free kick in the defensive half. Corner, Liverpool. Conceded by Cédric Soares. Substitution, Liverpool. Jordon Ibe replaces Daniel Sturridge. Attempt blocked. Sadio Mané (Southampton) right footed shot from the right side of the box is blocked. Assisted by Graziano Pellè. Attempt missed. Adam Lallana (Liverpool) right footed shot from outside the box is high and wide to the right. Assisted by Emre Can. Offside, Southampton. Steven Davis tries a through ball, but Ryan Bertrand is caught offside.